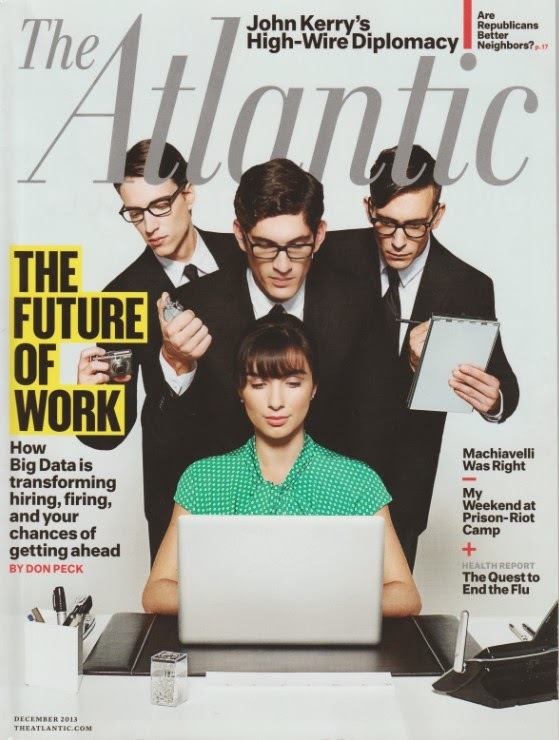 In the December 2013 issue of The Atlantic, Don Peck writes about the future of work in They're Watching You At Work. Its a great addition to the ongoing discussion about the impact of digits on the world of work. Think Moneyball, Billy Beane, the Oakland A's. Expand the concept. Enter workforce analytics and people analytics (the Moneyball approach to talent management). There's demand in this area and tech companies are expanding or launching to provide services. The basic concept is simple; measure, rate, and grade everything because it is increasing "easy" to do so. 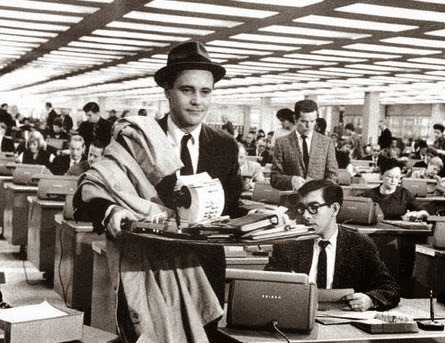 As Mr. Peck points out, workforce analytics is not new. He references William H. Wythe Jr.'s 1956 classic, The Organization Man, which describes the prevalence of employee evaluations that measured and scrutinized "aptitude, skills, personal history, psychological stability, discretion, loyalty." By the late '70s, organizations were moving away from this to a blind audition hiring model. And now, 30 years later, they are back at it. The difference this time is the digit and the rise of Big Data. Reading the comments posted about the article I found one particularly interesting. The poster "charlesbrons" correctly points out that the field of Industrial/Organizational Psychology has been in existence and producing lots of data and information for decades. Fair enough, he's right. However the difference is that Big Data is like a virus. The growth in computing power and storage capacity are exponential and unceasing. Programming and app developments leapfrog in amazing and unexpected ways. But the capacity to accumulate, store, and crunch data is WAY ahead of our collective ability to manage or even understand it. As I write this Target's massive security breach is front page news. The NSA/Snowden story is a year and a half old and the ramifications continue. The Big Data impact on the workplace and workforce is unsettling to some and this includes me. As one who blogs about workforce issues, I can expect plenty of digital revolution material going forward. But the workforce category is just a slice of a much bigger pie. The rise of Big Data is THE driver of a paradigm shift clearly on par with the Industrial Revolution. And...just like back then, technology is way out in front of the human being. Buckle up free agents and stay buckled. Its not all bad but you have to stay awake and on your toes. Labels: Big Data, digital revolution, Don Peck, free agent, Moneyball, The Atlantic, The Organization Man, William H. Wythe Jr.